Mr. Shifty from tinyBuild and Team Shifty — Scheduled to launch first on the Nintendo Switch this April, this fast-paced game requires players to teleport around bullets to perform takedowns while also breaking into the world’s most secure facility. It will also feature HD rumble to allow players to feel every punch, shot and crash. Stardew Valley from Chucklefish Games and Concerned Ape — An open-ended, country-life RPG inspired by Harvest Moon which while has appeared on other platforms, Nintendo Switch will be the first console to support the upcoming multiplayer feature heading to Stardew Valley. Shakedown Hawaii from vBlank — This spiritual successor to Retro City Rampage heading to the Nintendo Switch first in April. This 16-bit title parodies big business and white collar crimes. Build your empire, monopolize the markets and collaterally re-zone the island’s destructible sandbox. GoNNER from Raw fury and Art in the Heart — A colourful score based, procedurally generated platformer about a friendship between the protagonist Ikk and a whale named Sally. The console version of the game will launch first on the Nintendo Switch with additional content specifically for the Switch later this year. Flipping Death by Zoink Games — Zoink Games, creators of Stick it To The Man and Zombie Vikings, announced Flipping Death for Nintendo Switch. The game serves as a spiritual successor to Stick it To The Man, with its trademark Zoink humour and zany character design. Players can flip from the world of the dead to the living with the press of a single button. The game will also take advantage of HD Rumble on Nintendo Switch. Flipping Death is still without a release date, and will be coming to other unspecified consoles alongside the Nintendo Switch. This mixture of old and new will be accessible through the Nintendo eShop. To gain access to the eShop Nintendo Switch owners will need to perform the Day 1 update. The update can run in the background and install while playing any retail game. However to access the eShop from a web browser users will be required to load up the eShop from the Nintendo Switch first. This week, Microsoft announced the Xbox Games Pass, a subscription feature similar to Sony’s PS Now service. The program has already begun rolling out to select Insider Program members and a full launch is expected in the coming months, with Xbox Live Gold members being the next to receive access. 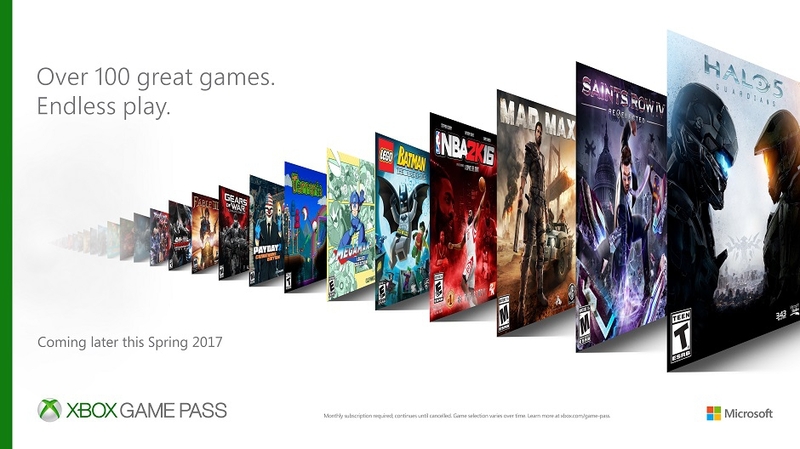 For $9.99 USD per month, the Games Pass gives subscribers access to over 100 Xbox One and Xbox 360 backwards compatible games. Users are able to download full games, meaning there won’t be any streaming problems to contend with. Subscribers will also receive a discount on any Xbox One game or add-on in the catalogue. Much like Netflix, the games will change over time as new ones are added and others are cycled out. Titles available at launch include Halo 5, Saints Row VI, Mad Max, Fable III, Terraria, and more. The leak from last weekend has been confirmed: the follow-up to the acclaimed Shadow of Mordor not only exists, but is nearing completion. Again developed by Monolith Productions, Middle-earth: Shadow of War, the official description of the game is as follows: "Players wield a new Ring of Power and confront the deadliest of enemies including Sauron and his Nazgul, in a monumental battle for Middle-earth." Middle-earth: Shadow of War will be released on August 22 in the Americas and August 25 in Europe for PlayStation 4 and as a Play Anywhere title on Xbox One and Windows 10 PC. A Project Scorpio launch is expected later this year, around the holiday season. One purchase of the game will give you access across all three platforms. Xbox Play Anywhere will sync across all devices, including save data. Promised as a "true spiritual successor to Maniac Mansion and Monkey Island" by the minds behind these classic adventure games, the upcoming point-and-clicker Thimbleweed Park — described as a "neo-noir mystery” — will plunge players into a smalltown murder case. It’s been over two years since the game was successfully funded in a Kickstarter campaign. The developer is Terrible Toybox, which consists of erstwhile Lucas Arts creators Ron Gilbert and Gary Winnick plus a development team. "Play and switch between all five characters as you explore the vast, strange, and manipulative world of Thimbleweed Park while unraveling a dark and humorous neo-noir mystery. Solve puzzles dreamed up by the brains of Ron Gilbert and Gary Winnick, creators of the original point & click adventure game, Maniac Mansion." Thimbleweed Park has officially been confirmed for release on March 30, 2017 for Xbox One, and PC/Mac/Linux. The title is additionally planned for release on iOS/Android and PlayStation 4, to launch later this year. The developers have also expressed interest in a version for the Nintendo Switch.